HIS beautiful little sky-blue feathered creature is well named Azure Warbler, or again White-throated Blue Warbler, and is the most abundant of the genus here. It is a bird of the wood, everywhere associated with the beautiful tall forests of the more northern counties of western New York, sometimes found in the open woods of pasture-lands, and quite partial to hardwood trees. In its flitting motion in search of insect-prey, and in the jerking curves of its more prolonged flight, as also in its structure, it is a genuine Wood Warbler and keeps for the most part to what Thoreau calls the “upper story” of its sylvan domain. All Warblers, it has been said, depend upon their markings rather than song for their identity, which renders the majority of the tribe of greater interest to the scientist than to the novice. Until you have named four or five of the commonest species as landmarks, you will be considerably confused. Audubon described the song of the Cerulean Warbler as “extremely sweet and mellow,” whereas it is a modest little strain, says Chapman, or trill, divided into syllables like zee, zee, zee, ze-ee-ee-eep, or according to another observer, rheet, rheet, rheet, rheet, ridi, idi, e-e-e-e-ee; beginning with several soft warbling notes and ending in a rather prolonged but quite musical squeak. The latter and more rapid part of the strain, which is given in the upward slide, approaches an insect quality of tone which is more or less peculiar to all true Warblers, a song so common as to be a universal characteristic of our tall forests. It is not strange that the nest of this species has been so seldom discovered, even where the bird is very abundant during the breeding season. It is built in the higher horizontal branches of forest trees, always out some distance from the trunk, and ranging from twenty to fifty feet above the ground. One described by Dr. Brewer, found in Ontario, near Niagara Falls, was built in a large oak tree at the height of fifty or more feet from the ground. It was placed horizontally on the upper surface of a slender limb between two small twigs; and the branch on which it was thus saddled was only an inch and a half in thickness, being nine feet from the trunk of the tree. The abandoned home was secured with great difficulty. The nest is a rather slender fabric, somewhat similar to the nest of the Redstart, and quite small for the bird, consisting chiefly of a strong rim firmly woven of strips of fine bark, stems of grasses, and pine needles, bound round with flaxen fibres of plants and wool. Around the base a few bits of hornets’ nests, mosses, and lichens are loosely fastened. The nest within is furnished with fine stems and needles, the flooring very thin and slight. The bird is shy when started from the nest, and has a sharp chipping alarm-note common to the family. 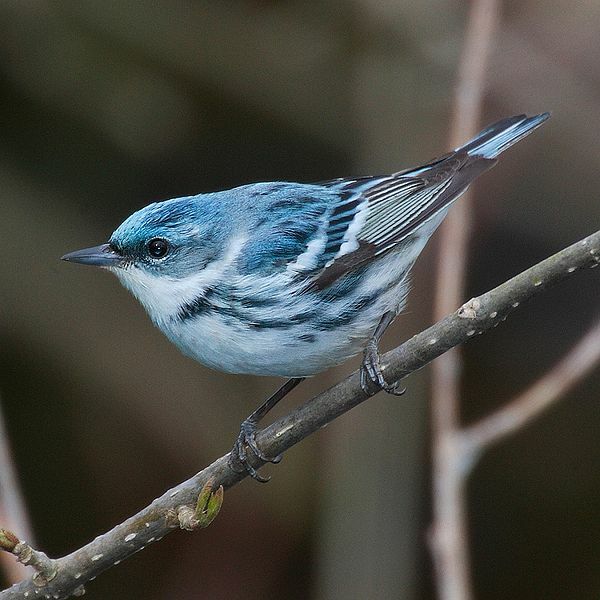 The Cerulean Warbler is found in the Eastern States, but is more numerous west of the Allegheny mountains, and throughout the heavily wooded districts of the Mississippi valley. In winter it migrates to Central America and Cuba. The Warblers are of unfailing interest to the lover of bird life. Apart from the beauty of the birds themselves, with their perpetually contrasting colors among the green leaves, their pretty ways furnish to the silent watcher an ever changing spectacle of the innocent life in the tree-tops. Range—Mississippi valley as far north as Minnesota, and eastward as far as Lockport, N. Y. (Davison.) Winters in the tropics. Eggs—Four, creamy-white, thickly covered with rather heavy blotches of reddish brown. The Lord has given us another neat little bird to observe. The color reminds us of the blue sky above. The Cerulean Warblers are part of the Parulidae – New World Warblers Family. “Adult males have pale cerulean blue upperparts and white underparts with a black necklace across the breast; they also have black streaks on the back and flanks. Females and immature birds have greyer or greenish upperparts, a pale stripe over the eye, and no streaking on the back and no necklace. All of these birds, regardless of their age, have wing bars and a thin pointed bill. A small wood warbler of about 4 inches (11.5 cm) in length, with long pointed wings, short tail, and long under tail coverts. Males have blue upper parts and white below with black streaking on back and upper tail coverts. Females are bluish-green to olive-green above with white under parts and a white or yellowish eyebrow stripe. Both sexes have 2 white wing bars and white tail spots. Juveniles are similar to female with brownish/gray upper parts, white under parts and a pale crown stripe. The cerulean warbler is often found high in the canopy of mature forests. Their breeding habitats are mature deciduous forests in eastern North America. They migrate to spend the boreal winter in forested mountain areas in South America. The cerulean warbler is an early migrant and arrives on breeding grounds up to 2 weeks before other wood warbler migrants. Males arrive one week before females and pairs form as soon as females arrive. Age of first breeding is one year. 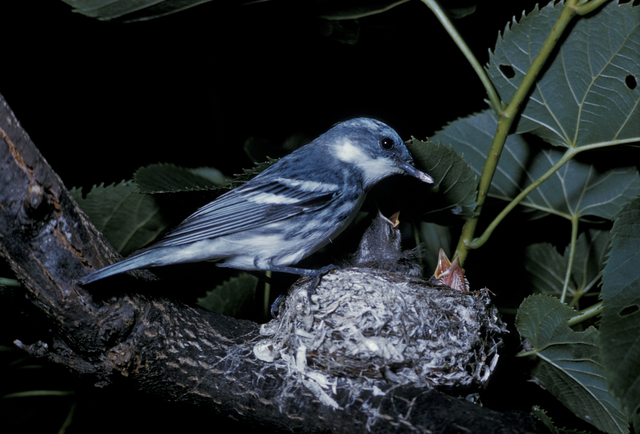 Both sexes participate in nest site selection but construction is carried out by the female who may take up to a week to construct the nest. They forage actively high in trees, sometimes catching insects in flight. These birds mainly eat insects. Their nests are cup-shaped, and are placed on a horizontal branch high in a hardwood tree. The song is a buzzed zray zray zray zray zeeee. The call is a slurred chip. The Cerulean Warbler is the fastest declining neotropical migrant songbird. Among the many threats they face, their wintering habitat in the northern Andes is dwindling rapidly. Cerulean Warblers depend on shade coffee plantations during the winter. In fragmented forest areas, this bird is vulnerable to nest parasitism by the Brown-headed Cowbird. This bird’s numbers are declining faster than any other warbler species in the USA; its population in 2006 was less than one-fifth of what it was 40 years before. 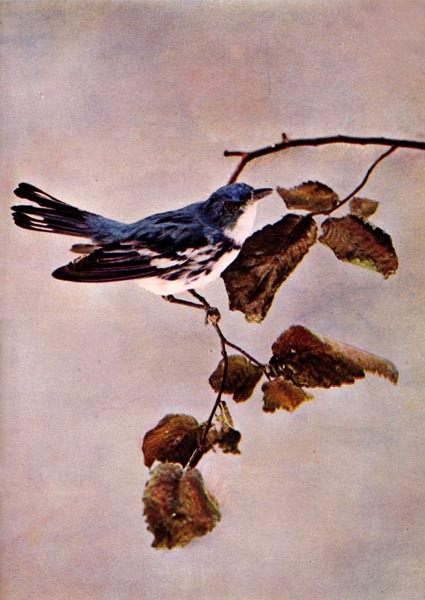 This entry was posted in Birds, Birdwatching, Christian, From The Past and tagged Azure Warbler, Birds Illustrated by Color Photography, Cerulean Warbler, Home School, Kids, Nature, Parulidae, Photography, Youth. Bookmark the permalink.